Do you like to lavish your love with gifts? Why not start with this beautiful floral gift? This cube arrangement blends Roses, Mini Hydrangea, Green Trick Dianthus and Hypericum Berries to set a stage for the symbol of love. Loops of lily grass create a heart to show your true sentiments. 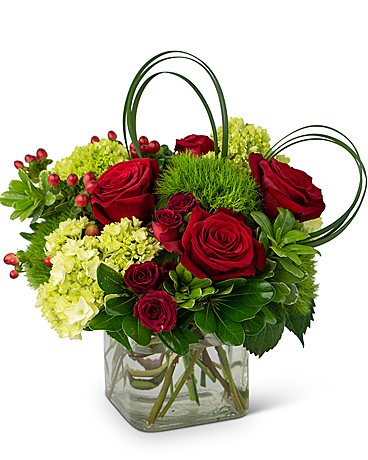 Show her you're over the top, crazy mad in love by sending The Lavish Love arrangement.